Today I noticed a difference in myself. This morning I was browsing through the latest IKEA pages in my early morning stupor accompanied by my trusted cup o' joe and it's almost as if I'm looking through "O" (Oprah). Nothing grabs me. I'm not emotionally seized by the Norden occasional kitchen table, though it is chic, or the simple yet dashing Ulsberg nightstand. 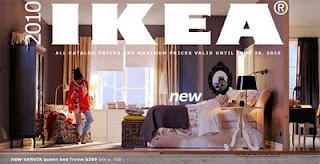 Last year at this time, I could not STOP looking through the IKEA magazine and website, convinced I needed almost everything to make my apartment look as clean-cut, organized and smart as the collection of rooms featured within those vibrant pages. Reflecting back, I realize, I've been there, done that. And perhaps my 500 square foot apartment is a blessing in disguise. There is no room for anything else. Sure, I could fit a couple Salong vases or a classic Dekad alarm clock, but I feel something I didn't expect. I feel satisfied. My apartment is certainly not nearly in contest with the perfect rooms within those flashy pages, but it's got something to offer and I've done by best to turn our outdated wallpaper and hideously cheap maroon rug into the setting for a stylish apartment, with touches of updated furnishings and decor. Oh, the glories of renting. There's only so much I could do and I did my best. Maybe this year, I'll just settle for the vases.